There's something about this time of year that brings friends and family together more often and our holiday entertaining has only just begun. But that always leads to the question of what to serve. We're all about great cocktails, as you should know by now, and love introducing our guests to new flavors. Savory herbs are so interesting when paired with sweet ingredients and I've been playing with the combo of fresh thyme and maple syrup. I love how it plays off the warmth of a good spiced rum and a touch of lime brings it all together in a great cocktail. 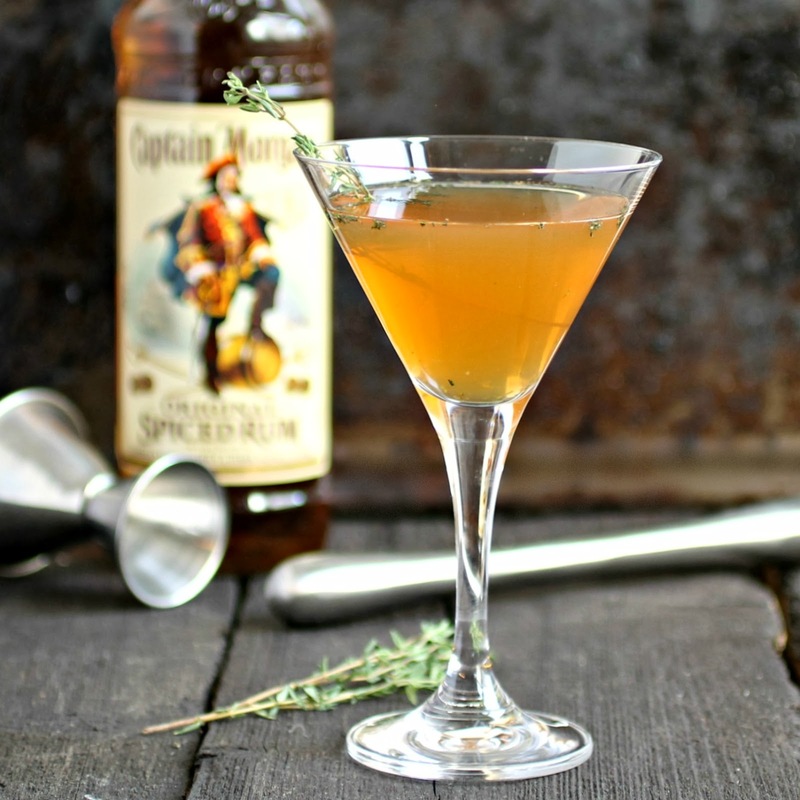 Add the thyme and maple syrup to a cocktail shaker and muddle together using a muddler or the back of a wooden spoon. Add the rum, lime juice and bitters. Fill with ice, shake well and pour into a chilled cocktail glass. So now on to the question of what food to serve. Since I was already working with thyme and rum, I thought both could work double duty in the appetizer as well as the drink. We've all seen wheels of brie baked in pastry and they have the advantage of being able to be made in advance. You can prep it the day before and keep it, unbaked, in the fridge until just before guests arrive. But I wanted to make it more special with fresh herbs and an interesting sauce. Wines and liqueurs are frequently used in cooking to enhance flavor so I decided to add the spiced rum to a batch of homemade cranberry sauce. As soon as I added it, it instantly gave the sauce a much deeper flavor. A little something "extra" as it were. It was amazing on its own, at our Thanksgiving table, and even better paired with the baked cheese. And the fresh thyme, baked into my homemade pastry, played so well off the sweet and tart sauce that these baked bries have been disappearing quickly at our house. Enjoy! To make the pastry, combine the butter, flour and salt in a food processor with a steel blade and pulse just until it resembles course crumbs. Add the thyme then slowly pour in the ice water and pulse just until combined and a dough ball forms. Wrap the dough in plastic wrap and refrigerate for at least half an hour. While the pastry is chilling, make the compote by placing the cranberries, sugar, water, salt and orange zest in a pot. Simmer on a medium low flame for approximately 15 minutes, stirring occasionally, until the cranberries become soft. Remove from the heat, add the rum and allow to cool. When the dough has chilled, roll it out on a well-floured surface to approximately a 9" round. 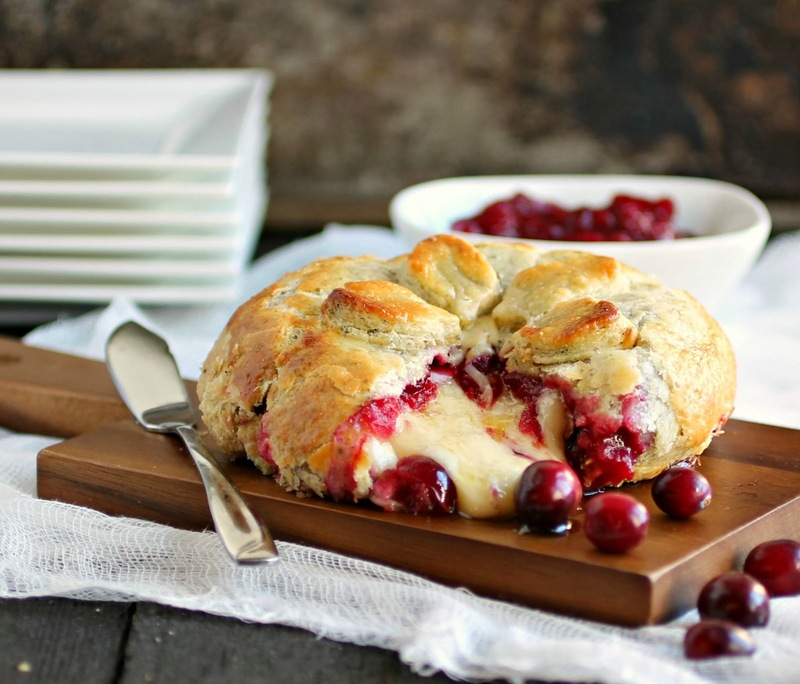 Mound the cranberry compote in the center and place the wheel of brie on top. Fold up the pastry and cut off the excess to use for decoration. 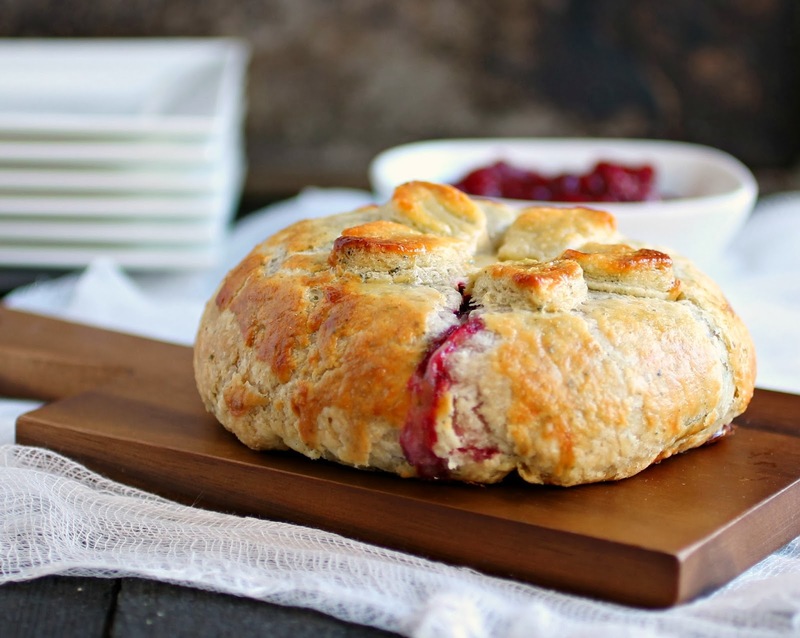 Flip the wrapped brie over, seem side down, onto a baking sheet lined with parchment paper. Roll out the excess dough and cut out leaf shapes, if desired. Mix the egg and cream together in a small bowl and brush it onto the pastry. This will help keep any decorative leaves in place and allow the pastry to brown. Bake in a pre-heated 425 degree oven for 20 - 30 minutes or until the pastry is a light golden brown. Serve warm. Note that I've been working with Captain Morgan Rum and Chef Hugh Acheson on the CaptainsTable challenge. For every recipe we bloggers create with the #CaptainsTable hashtag, $1 will be donated to WhyHunger. If you have recipes to share on social media, please add the hashtag as well and check out other ideas on their Facebook and Pinterest pages. Looks like a perfect pair! I love that we both did a baked brie. I can't wait to see what you come up with for the next round. This cocktail sounds amazing. I am going to have to hunt out some new bitters. I've never heard of Angostura bitters before. The rum maple cocktail was so delicious! I served it to friends on New Years Eve and they emailed me the next day begging for the recipe. It's a keeper... thanks! just a comment... since I look for recipes to put on Pinterest I look for ones where I can pin ONE recipe and not the whole page that may contain other recipes of different things. 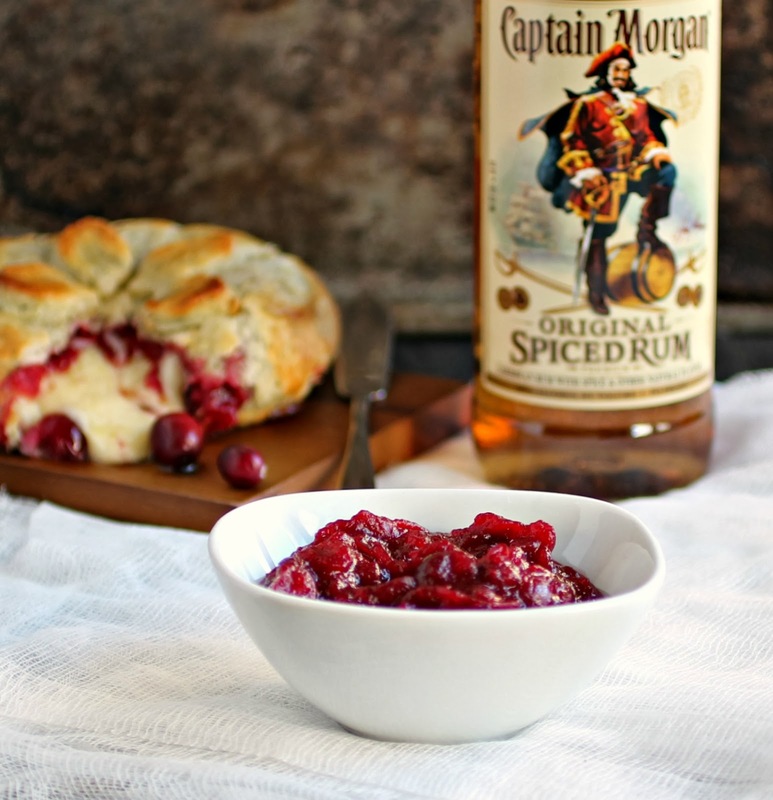 This page has one recipe that I would like for the drink.. and another I would like for the Brie. But.. I won't pin it because it needs to go in 2 different places. Since you are on Pinterest yourself, you might consider some minor changes but always refer to the other recipe with a hyperlink in your post.